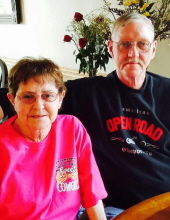 Rita J. Riley Akers, 76, of Zanesville, died at 12:13 P.M. on Tuesday, January 22, 2019, at Genesis Hospital, Zanesville. She was born September 2, 1942, in Zanesville, a daughter of the late Donald and Rita Jean LaMay Pettry. She retired from Brockway Glass after twenty-two years of service. Rita was a passionate, loving, person and was known as "such a sweet woman". She never met a stranger and let her family know each and every day the love that she felt for them. She had the most gentle of hearts with an amazing spirit of strength. She is survived by her husband of twenty-nine years, JR Akers whom she married November 20, 1989; three daughters, Rhonda Watts, Marsha (William) Macenko, and Juni (Steve) Runkle; three sons, Don (Kelly) Riley, Mike (Hope) Riley, and Mathew (Alicia) Akers; twenty grandchildren, thirteen great-grandchildren; and many nieces, nephews, and cousins. In addition to her parents, she was preceded in death by her first husband, Ronald Riley, who died in 1982; and a grandson, Xian Akers. Friends and family may call from 2-5 P.M. on Sunday, January 27, 2019 at the BOLIN-DIERKES FUNERAL HOME, 1271 BLUE AVENUE, ZANESVILLE where funeral services will be held at 11:00 A.M. on Monday, January 28, 2019, with Pastors Andy Winters and John Brothers officiating. She will be laid to rest at Woodlawn Cemetery, Zanesville. To send a note of condolence, or to order flowers or comfort food: visit www.bolin-dierkesfuneralhome.com , follow us on Facebook, or call our professional staff at (740)452-4551.